Lucia Udvardyova is the blogger behind Easterndaze, a blog celebrating new music from Eastern Europe. She is also an Electronic Beats correspondent and writes the monthly column Eastern Haze. For this feature she is one of seven voices in our series of monologues on the city of Prague. Read more here. I moved to Prague in September 2001 on a stiflingly hot day in the middle of an Indian summer, armed with a suitcase and a reckless carte blanche attitude. The room I had planned on renting fell through after my would-be landlady greeted me a tad too suspiciously, and I ended up couchsurfing with people I barely knew for a couple of months. I remember seeing the hyperreal images of 9/11 on a small TV set in Háje, a concrete block estate on the outskirts of the city encircled by typical communist housing desolation. Previously, I had been living in London and honestly, I never planned to live in the Czech capital. But after returning from the UK, I just couldn’t imagine staying in Slovakia, my “motherland”, anymore. A friend of mine was moving to Prague to do a short-lived course in chemistry and I, pretty desperate at the time, tagged along. The early years were like a catharsis, spent doing odd jobs which included selling chewing gum to tourists at the Old Town Square, working early mornings at a supermarket, and interning at a newspaper called The Prague Pill while studying semiotics at university. Unlike Slovakia’s capital Bratislava with its former subterranean atomic bunker U.Club, Prague was never a techno city, even though I would go to techno parties back then. Most of the techno events in Prague took place at clubs like Roxy or Paradogs—the latter situated on one of the floors of the five-story Karlovy Lázne “superclub” near Charles Bridge, which these days is more of a tourist trap. Still, on any given Saturday you’d have the likes of Regis doing live electronics. Then there were the events connected to the buoyant Czech free party scene and its various soundsystems, such as Cirkus Alien. Their annual gathering was the CzechTek, which famously ended in a brutal altercation between the riot police and the festivalgoers in summer 2005. In 2006 the city’s electronic scene was kickstarted by the fledgling Sperm Festival, a music and new media event that championed cross-genre lineups, from dubstep—when it was still good—to post-IDM and other forms of electronics. In recent years, the cross-pollination of the art and music scenes has flourished in the city, largely thanks to the three art academies: the prestigious film school FAMU, the Prague Academy of Fine Arts, and the UMPRUM Academy of Arts, Architecture and Design—all of which have seen the arrival of a new generation that is as much into art as music. In my opinion, an important catalyst has also been the fiercely independent art and music collective A.M.180, spearheaded by Štepán Bolf and the siblings Jakub and Anežka Hošek, formerly known under their DJ moniker Indie Twins. These are underground music evangelists very much in touch with the latest goings-on in other more thriving world metropolises. A.M.180 has nurtured a small but avid audience of music afficionados at cosy venues like 007 Strahov, situated in the block of a large dormitory on top of the Petrín Hill, or in Final—a stone’s throw from the main station. Their activities culminate every year in the Creepy Teepee festival held in the historical town Kutná Hora. Of course, Prague also has a whole crop of new bloggers, fashionistas and Vice Magazine types eager to show off the latest garb and celebrate the middle of the road underground. MeetFactory, a spacious warehouse situated in an industrial part of the Smíchov district, has become the place to see and be seen, especially under the more recent musical direction of Michal Brenner. Its autumn calendar is already brimming with names like Dan Deacon, Beach House or Holy Other. Off spaces have mushroomed in the last couple of years, especially in Žižkov, a former working class district with the city’s highest concentration of bars per square meter. This is a pretty good bet when you are looking for good food and gigs. The now legendary drinking den Blind Eye, popular with expats, has closed, but Bukowski’s remains, as does the creative hub City Surfer—a gallery space that also hosts parties. Letná, a leafy district across the city center, is popular with boho parents and artists. Local creative types hang out until the wee hours at the Bio Oko, an art house cinema. Within a stone’s throw from Oko is the recently opened Nová Syntéza café and venue that aims to attract the young generation. 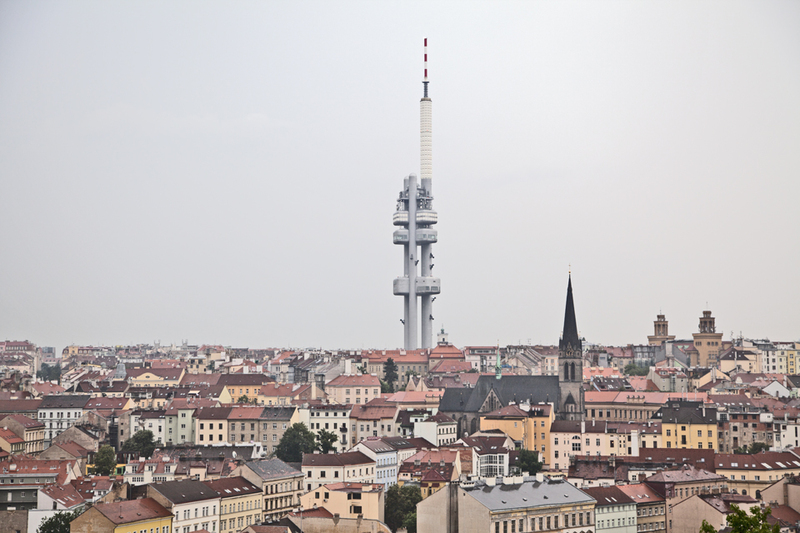 Down the street is the towering Bubenská 1—a white functionalist office block with spaces rented out to artists and Umelec magazine publisher Divus, who also runs the Prager Kabarett gallery near there. Aside from exhibitions there are also gigs—I’ve seen William Bennett’s Cut Hands project there, for example. If you end up in Letná, go to Berlínskej Model, a tiny, but happening art space. Žižkov and Letná are where most of my friends live. Unlike me, that is. I live in Palmovka, an old Jewish ghetto and industrial zone that’s fallen pray to urban development and drug dealers. I am into psychogeography, so walking is my favorite thing to do in Prague. I enjoy immersing myself in the atmosphere of a specific environment, observing the people and everyday life particular to certain urban geographical areas. Prague is a strange place indeed. The art and music scenes are pretty small and insular and are rife with a persistent periphery syndrome. This is also coupled with the burden of history and an omnipresent disappointment with post-communist development. Of course, Czechs in general tend to see things a bit bleaker than they are so this should be taken with a grain of salt. That said, people here seem to lack the hunger, drive and general cutthroat mentality of larger cities, which can also work to the city’s advantage. Here it’s easy to forget yourself in a time warp where history erases the present and the future remains uncertain. The friend with whom I arrived in Prague left long ago. I’m still here, but more often than not, I tend to flee the city’s sedative grasp only to return a few weeks later wondering what is it that keeps bringing me back.